Landon Donovan was sensational against Chelsea, save for Louis Saha’s two goals, Donovan I think was up for Man of the Match honors. 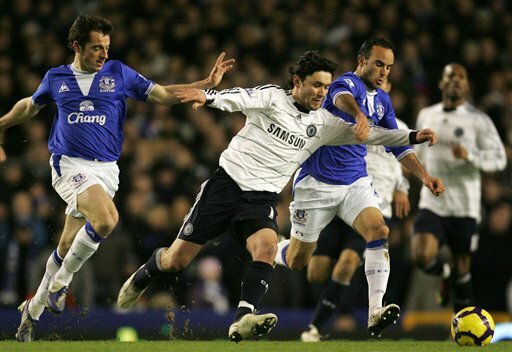 Donovan won a penalty, hardly put a foot wrong, and was probably Everton’s most dangerous attacking outlet. He no doubt won more fans amongst the Evertonian crowd. He was dangerous all night putting in dangerous cross after dangerous cross. His best ball of the night didn’t actually get enough credit from the announcing crew, since he won a penalty just seconds later. The play before Donovan sent in a pin point aerial through ball just over the head of Terry – a pass that should have been put away. But this was his most complete performance not because of his attacking work, but due to his work ethic on the defensive end. He helped contain Ashley Cole all night, who was a total nonfactor. Donovan gave Cole fits going forward as well and should an aggressiveness and physicality we have rarely seen from Donovan. I was most proud of Donovan when he took a total cheap shot on Cole – the ball was floating in the air and Donovan not even looking at the ball just cleared out Cole. Donovan also went in for a tough challenge against Mikel won the ball and was fouled (unfortunately it wasn’t called). Donovan rightly received a yellow card for a chippy foul late, but it was really for an accumulation of fouls and that in and of itself represents an accomplishment in my book. Donovan was not afraid at all to put in a challenge and get physical. I have always thought of Donovan as a bit of defensive liability and a softy, he is disabusing me of that view. From the perspective of US-England, Donovan definitely got the better of Ashley Cole, a fact that should boost Donovan’s confidence and that of the US come June. Thanks for the summary – no Setanta, no viewing for me. I think the thing about Landon’s success with Everton that delights me most is he’s not going over there as some sort of show pony or savant. He’s fitting in seamlessly with a tactically astute team, doing his part, and clearly able to handle the technique, concentration and speed of thought necessary at the highest level. And he’s a friggin’ Yank! Delightful. Reports indicate that Donovan broke Cole’s ankle.